Staff photo by Tim Barber Dade County Executive Ted Rumley works in his office in Trenton Thursday, Dec. 13, 2018. TRENTON, Ga. — Dade County officials received criticism for their recent $500,000 land deal. So they have proposed a long-term change that doesn't address the criticism of the $500,000 land deal. The county commissioners will hold a joint meeting with the Trenton city commission on Jan. 15 at 6 p.m. to discuss the structure of the Water and Sewer Authority. Currently, the county appoints four residents to the authority board. The county executive, Ted Rumley, automatically serves as the board's chair. 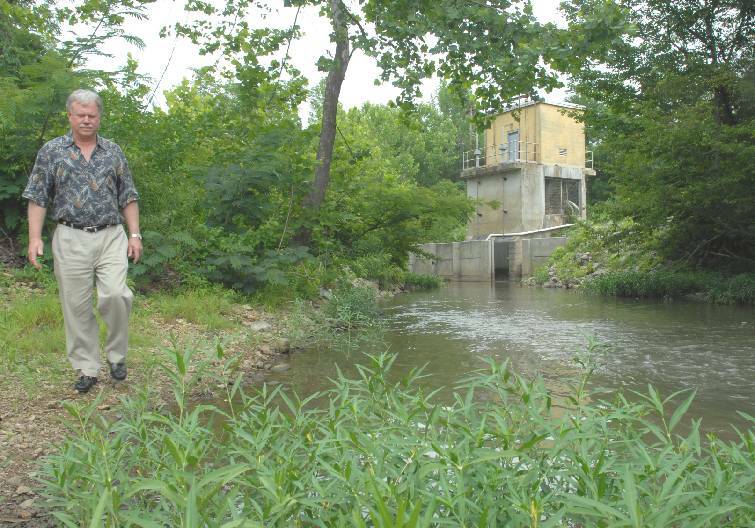 Doug Anderton, general manager of the Dade County Water Authority, walks along Lookout Creek near the raw water intake. "This is one of few creek in the area that flow in a northerly direction," said Mr. Anderton. "We are presently taking 2.3 million gallons per day from Lookout Creek." The elected officials will discuss next week whether to remove some appointments from the county, instead giving the city power. They will also discuss removing Rumley from the position of authority chair. They believe that will satisfy critics of the land deal, signed last month for the purchase of 61 acres that officials hope will one day be the site of a reservoir. But at the same time, commissioners and members of the authority both say Rumley hasn't done anything wrong. As chair of the five-member authority board, he sets meetings and casts tie-breaking votes. Last month, the authority voted unanimously to buy the land — meaning Rumley did not directly impact the decision. "It's optics," County Commissioner Allan Bradford said of the proposed change. Said authority board member H.A. McKaig: "There is a certain segment in this county — same as there are everywhere — that they don't like Ted. So whatever he wants, they're automatically against it. We wind up fielding a lot of foolish questions that are only caused because politics are involved." To be sure, McKaig and authority board member Eddie Cantrell said, there were plenty of problems with the land acquisition. For starters, the county commission voted to negotiate the purchase in the summer of 2017. From there, Rumley headed up the negotiations. But discussions about the looming deal remained in executive session, away from the public. When the commissioners and the authority finally held a joint, public meeting on the issue in November, residents criticized both boards. Most pressing, the residents wanted to know how much the reservoir project would cost, whenever the commission and the authority decides to build it. McKaig said he also talked with skeptics in private, several wondering whether Rumley will somehow profit personally from the deal. McKaig said there are no facts that back those accusations. McKaig and Cantrell both had other problems with the land deal, with more direct criticism of Rumley. They said he told them initially that the authority could pay for the land with the county's Special Purpose Local Option Sales Tax Fund. Coming from a 1 percent burden at the cash register in the county, the fund is currently bringing in about $200,000 a month, Rumley said. But this fall, he told the authority that they couldn't actually use the fund. Voters approved the 1 percent tax on a referendum in 2014. And when they did, the county provided a list of projects that the money would go toward. The county has flexibility with the list. But Rogers told Rumley that legally you have to be more strict if you use those funds on behalf of the authority, which is a company that is mostly separate from the county. If the county wanted to use that fund for the authority, Rogers said, it needed to specifically outline the stated project during the vote in 2014. A reservoir was not on the list. Rumley said he believed there was more flexibility. For example, the list includes "facilities," and he believed the county could argue that a reservoir is a facility. Nevertheless, he deferred to the attorney. Also, Rumley said the county commissioners could have purchased the land from the sales tax fund themselves. Instead of giving the money to the authority, which would then use it to buy the land, the commissioners could just directly make the payment. This is where the real explanation comes in: Rumley said the commissioners did not want to use their money for the purchase. "If that project had been a priority [for the commissioners]," he said, "it would have been different." When negotiations started in the summer of 2017, McKaig and Cantrell understood that the authority would only pay one-third of the price for the purchase. The county and the city of Trenton would handle the other two-thirds. This would have put the authority's burden at about $166,000. Instead, the city commission never voted on whether to join the deal. Mayor Alex Case said the commissioners told him in executive session they didn't want to spend the money. Then, instead of a 50-50 split, the county asked the authority to pay 80 percent of the deal. That put the price tag at $400,000, with the county paying the other $100,000. Rumley said it was an appropriate split, because the authority is responsible for the water. "It's just not the way we were going when we started this thing," McKaig said. "It caused a lot of ruffled feathers." Rumley explained that the authority has wanted to build a reservoir in the county for decades. Though it doesn't need extra water, the authority has seen the reservoir as an asset for growth. If big manufacturers are interested in moving in, the county can show off its deep supply of extra water, estimated at about 158 million gallons. In the late 1990s, Rumley said a surveyor looked at property in the county and highlighted the 61-acre tract, which was owned by Jack Sells. At the time, the owner's family was not interested in selling. But around June 2017, he told Rumley he was ready to unload the property. He said he had other offers. When the commissioners voted to begin negotiations, they paid Sells $50,000 up front. They later received a grant to give him another $25,000. Some authority members felt pressured, seeing the county's sunk cost. "We were essentially going to cost the county $75,000 if we didn't go along with the plan," Cantrell said. " It bothered us that we were not involved in any of the negotiations. Then all of a sudden it was thrown in our lap." Case has lobbied for the city to be tied to the authority board because he said the two sides need to communicate better. The city operates the sewer plant. Yet, the authority installed sewer lines in the south end of the county without working with the city. The city does not have a map of the lines. There is also no memo of understanding among the authority, county and city outlining what happens if a sewer line breaks. The authority laid the line, but the city is responsible for the sewer system. Another problem? Case said four fire hydrants in the city have been broken for nine months. He believes the authority is supposed to fix them. But despite multiple inquiries, he said he doesn't know when — or if — they will get fixed. "The city needs a voice," Case said. "It's not that I want control. It's not that the mayor position wants control. It's that we want to be part of the team."